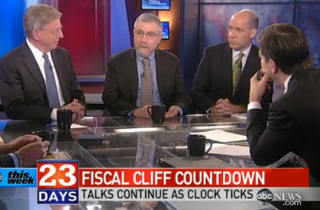 But Krugman drew more than just Matalin’s ire during the panel segment of ABC’s This Week. Many have overlooked conservative columnist George Will‘s additional slam on the New York Times columnist. “I have yet to encounter someone who disagrees with you who you don’t think is a knave, or corrupt, or a corrupt knave,” said Will. “No, I’ve got some people,” Krugman said in response. Will might be onto something here. As Mediaite readers may recall, Krugman does have a history of assuming the worst of his political opponents. After appearing on a CNBC segment in which he was in the minority, Krugman blasted the show’s panelists as guilty of “zombie” ideas. Another time, he battled Rep. Ron Paul (R-TX) on Bloomberg TV, and poo-poo’d the congressman’s ardent fans who dared suggest that Krugman lost the debate. Of course, when dealing with someone who claims “I have been right about everything,” it’s sort of a given that he will likely never assume the intellectual honesty of anyone with whom he disagrees.